However, I had something like ALTERNATING HITCH (or NITCH) SWITCH for which letters to move. Clearly we had to ’empty’ the underworld or Hell and move alternating letters, but did I need only to move some of them to put all the devils in the upper world or did I need to move all the alternating ones? I opted for the second alternative but wonder whether a better understanding of the message might have led to the first. I found my eight devils, with Mrs Bradford’s help: INCUBUS, EBLIS, DAVY JONES, MEPHISTO, APOLLYON, BEELZEBUB, SATAN and LUCIFER. (SATAN was a lovely give-away and confirmed what was needed. This part of the solving was pure entertainment after a very long drawn out battle to produce our original grid. What difficult clues some of them were with misprints that didn’t always leap into view. But have I forgotten something? Does Eck maintain his place at the Listener bar? He left little doubt: ‘Apparently a patient producer of drams (6)’ led to ONE ILL or ‘a producer of DRAMA – O’Neill – no drams there then, but the next clue continued the alcohol theme. ‘Phoenician betters level of acidity in drinks (6)’ Giving us a misprint for letters, ALEPHS and putting PH into ALES. Mixing the drams and ales produced the expected effect, ‘I am primarily blotto, ensnared by eg Kolsch (7)’. Google tells me that Kolsch is German beer so that gave me I’M with BIER round B(lotto) or IMBIBER. No wonder we got ‘one in pickle’ in the next clue which put SOUSE round BI to give us a SOUBISE or an old tie. With all that imbibing, I am amazed that Eck could create such subtle clues – or such a masterpiece of construction. Thank you Eck! It has been 2½ years since ’Eck’s last Listener. That was based on Hamlet’s “…I could be bounded by a nut-shell…”. Before that, we had Graham Greene’s Brighton Rock, so I guessed that ’Eck liked literary themes. So, no clue numbers or bars in the printed diagram, but clues in the right order, but not numbered. What could possibly go wrong?! All this meant that the grid fill, and consequently the various messages, were a long time coming. But what was more bizarre was that the grid was divided in two by the bar across the middle. Effectively we (for that, read “I”) had solved two separate puzzles without realising it. And one half, region B, had to be erased. Half the puzzle disappeared before my eyes! As for the messages, I wondered if we were dealing with a Hitchcock theme or the three witches from Macbeth, before the various letters revealed what was going on. Having said that, the “original speaker” and “the reporter and the source” needed unjumbling first. There were some ambiguities, but, for region A, I had R F [A/D] E [I/N] D N A I, and a bit of doodling soon revealed FERDINAND. Google revealed lots of Ferdinands, mainly emperors and kings, but googling “ferdinand quotations” obligingly revealed him as a character in The Tempest. Ah, yes, that one. Of course. That enabled the letters in region B, again with ambiguities, which were S A E R T [E/P] L [I/M] T I E P [E/P] T, to be disentangled to form the play and ARIEL. At least I’d heard of that character. The two sets of misprints were: Alternating hitch switch and In his third speech. It didn’t take long to track down “Hell is empty And all the devils are here.” This explained why region B, Hell, had to go bye-bye. Unfortunately, I had no idea what hitch switch was. A knitting term, I suspected, but googling didn’t help me. Unless PILEI wasn’t “fear wear of Romans’”. Anyway, casually looking at the grid, I could see possible devils: MEPHISTO was partially there in row 3 of the top grid and BEELZEBUB in row 6 of the bottom. 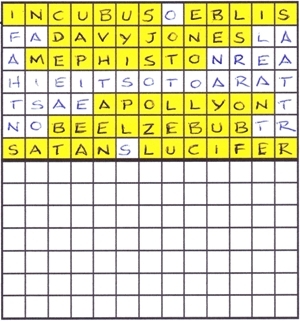 With a bit of guess work logic, I tried replacing alternate letters in the top half of the grid with their corresponding letters from the bottom, and there were INCUBUS & EBLIS in the top row, DAVY JONES in row 2, MEPHISTO, APOLLYON (row 5), BEELZEBUB, and finally SATAN & LUCIFER in row 7. What’s more, they were symmetrically positioned and we liked that. And so a fantastic puzzle from ’Eck was finished — correctly, I hope. Great fun, thanks. Eck’s preamble produced mild disquiet. We were going to look for either a missing letter or a letter added in each clue and these were going to lead to two different messages, a relevant location and clues to the identity of the puzzle’s subject. Mildly daunting – and it was still daunting even when we had completed the puzzle and worked out the endgame and looked for the location of that quotation from my favourite play and found it in ACT TWO, SCENE TWO, as we still had to find those hints to HAMLET in the extra letters. This is backward solving, as we clearly didn’t really need LITTLE PIG, GREAT DANE, or MOUSETRAP WRITER, but we did have to work those out just to make sure that we were not missing some obscure final requirement, say to translate the entire puzzle into Danish or Sanskrit or alphanumeric characters. However, I consoled myself by checking for Eck’s continued membership of the Listener Compilers’ Boozy Gang and he didn’t disappoint with ‘Mark stood behind son, drinking weak, stale pints (6)’ (OCHE S round W giving OWCHES – rather odd since OWCHE leads the solver to OUCH(1) in Chambers, which is ‘an exclamation of pain’, and clearly Eck intends us to parse this as STALE PIN[T]S and OUCH(2) is an archaic word for ‘a brooch’ – an error or is my BRB out of date? ), then, not surprisingly after those stale pints, ‘Cara’s drunk luminous discharge (3)’ giving CAR[A]* = ARC. Not an encouraging dose of alcohol but “Cheers” anyway Eck, see you in the bar.. Though we now encountered an accomplished set of clues, solving wasn’t easy and we were mystified by ‘Prat receiving short stroke finally tenders for part of track (6)’ which somehow had to give a word to complete T?R?IL. Neither Chambers nor TEA could offer a solution. Fortunately the unclued lights 27 of 45 46 emerged as A KING of INFINITE SPACE and, with a murmur of delight, I was directed to Hamlet ‘O God, I could be bounded in a nutshell and count myself a king of infinite space were it not that I have bad dreams …’ and it took only a moment to find a NUT?SHELL lurking in the grid with ‘DREAMS’ anagrammed (bad) within it. Problem solved – or almost. We were solving away from home and with no ODQ but, since T-RAIL fulfilled the requirement of ‘One cell contains a non-alphanumeric character’, we guessed that the ODQ must have added a hyphen to the Hamlet quotation and that A NUT-SHELL was to be highlighted and HAMLET be bounded inside it replacing his ‘bad dreams’. Nice one, Eck. I so appreciate replacement in crosswords when real words result – the sign of a master. Yes, we still had to tease some clues to the identity of HAMLET out of those extra letters and finally we got that amusing LITTLE PIG GREAT DANE MOUSETRAP WRITER; I muttered about MOUSETRAP WRITER. Sure, it was a cunning red-herring leading the unsuspecting solver to Agatha Christie but it was not quite accurate for Hamlet (Yes, Hamlet is a bit of a fetish for me – I did spend my final university year reading from end to end of the shelves on Hamlet in Manchester’s library and there were hundreds of them – probably still are). No, Hamlet was not the ‘MOUSETRAP WRITER’: he has inserted a ‘dozen or sixteen lines’ into a familiar play, probably a revenge tragedy, The Murther of Gonzago, in his attempt to reveal his uncle’s guilt (though the play also hints that Gertrude is the ‘mouse’). Still, apart from that grouse and the odd ‘Ouch’, we very much enjoyed Eck’s puzzle. Thank you Eck.